One of the things my family does every summer is watch America’s Got Talent. The first act that I really liked a few years ago was Recycled Percussion — and I got to see them live in Las Vegas this summer when I visited my grandparents in Henderson. I got a set of drumsticks used in the show — and an autographed set, too. 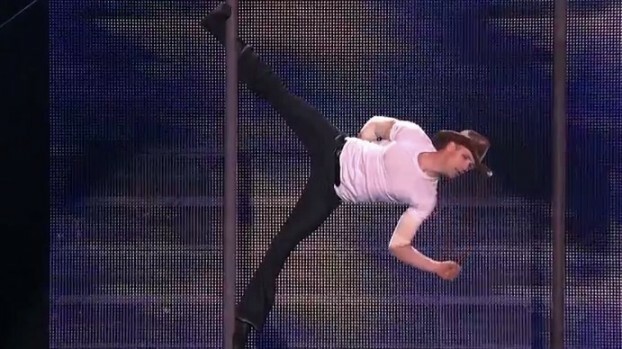 Timber Brown, a great aerialist and semi-finalist on America’s Got Talent 2013. This year, there were two acts I really, really liked. The first one was Timber Brown. He is the strongest aerialist I think I’ve ever seen. The things he does on a Chinese pole, silks, or any other aerial apparatus are simply amazing. I voted for him every time until the semi-finals. But in the semi-finals, he did a strange act with a water tank, and it just didn’t work. This video is my favorite Timber Brown performance of the season. Amazing! I still like him, though, and I would buy tickets to see any show he is in. But this week I voted for Kenichi Ebina, a dancer. He says that when he first came to the U.S. and danced, people laughed at him. They aren’t laughing any more! The way he combines dance and film and all kinds of special effects is just amazing. Go out to YouTube and watch his performance where he is “inside” a video game. It’s amazing. The thing that wasn’t obvious when I saw it on TV the first time is that Kenichi is every character in the video game — he filmed himself, and then choreographed himself dancing and fighting with the characters he played on film. Amazing! 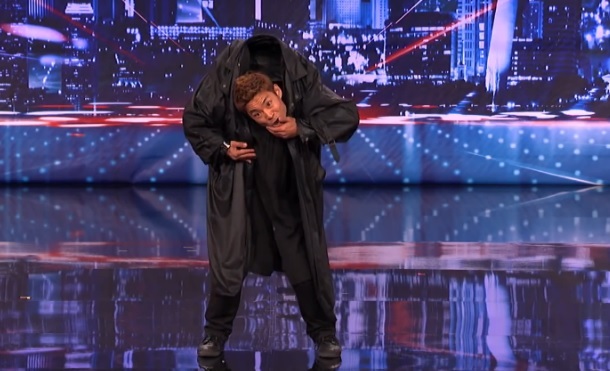 Kenichi Ebina, America’s Got Talent finalist 2013. I really like the KriStef Brothers, Chicago Boyz, Collins Key, and Innovative Force. I don’t like Cami Bradley, Jimmy Rose, or Taylor WIlliamson. If they have to have singers win, I hope it’s Braden James or Forte. The KriStef Brothers are amazing acrobats, and they’re hilarious, too. The KriStef Brothers aren’t really brothers. Kristofer and Stefan were raised together in circus families, and have been performing since they were 10. They learned acrobatics from Kristofer’s father, dance from his mother and Stefan’s mother, and clowning from Stefan’s father. I love the way they take really hard acrobatic moves and make them funny. It wasn’t very funny when Kristofer fell 8 feet onto his neck during a rehearsal, though. Luckily, he wasn’t seriously injured and they took a week off before coming back to compete again. This isn’t the first injury this year – one of the Chicago Boyz broke his leg in three places during a show, and will be out for the rest of the competition. Everybody at Lone Star Circus is always reminding us to be careful, and take moves slowly until we build up the strength to master them. Watching America’s Got Talent this year was a good reminder that even when you are very, very good, you can still get hurt. When I was in 4th grade, I was doing a final run-through of a performance for the end-of-year show at Lone Star Circus. I’d been rehearsing it for weeks and weeks, and I was sure I had it down. On Friday and Saturday, I’d juggled on the rola-bola in the first two shows, but on Sunday, I was going to add a segment where I climbed the silks, tied off, and then stand up (supported only by the cloth, and juggle. Somehow, I slipped, and fell straight backwards onto the stage. It was something like 10 or 12 feet — I’m not sure. I hit the concrete stage (padded by a thick rug) hard. I got the wind knocked out of me, but I wasn’t hurt. I wanted to do my run-though again, and was ready to climb up the silks. But Fanny Kerwich, the director, absolutely refused to let me anywhere near the silks. She said it wasn’t safe, and there wasn’t time for my unconscious to get over the fall even if I thought I was ready. So I juggled on the ground and the rola-bola for that show, too. There is absolutely no arguing with Miss Fanny (or my grandmother, either) when it comes to safety. I guess that’s good, but I sure was mad back then when they told me I couldn’t perform on the silks in the show where some of my friends and family were coming to see me on the silks! One of these days I am going to be good enough for America’s Got Talent. Not yet…but one of these days! This year it’s going to be hard to decide who to vote for in the finals. I like Kenichi, but I like the KriStef Brothers, too! I hope nobody else gets hurt, and I can’t wait to see the finals next week.